There are hundreds of ways to learn about leadership and communication. Many of them involve learning “tools and techniques” to become a better leader or a better communicator. This might be working, but it will be a long way until you find out what works best for you. Finding your personal style to become the leader, which truly matches your personality and feels right for you, can easily be supported by horses. Horses live in the present and communicate nonverbally most of the time. They’ve got a strong sense of authenticity and congruency and they will feed back to you what they perceive. Through different interactive exercises with your equine training partner, you will develop a sense of who you really are and which communication and leadership style feels right for you. You will get more and more effective in what you do, because you concentrate on your natural and instinctive behavior. To help you transfer your experiences to your personal life, we will support you in different ways, so that you only need to be present and enjoy yourself while you interact with your four-legged training partner. professional and has been with horses for over 20 years. 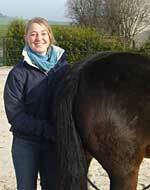 She is passionate about communication and learning – related to humans as well as to horses. Having worked as a trainer, consultant and project manager in international and national companies, she founded her own company in 2007.
doing” and with the support of a solid reflection and the link to suitable theoretical models, this approach enables sustainable learning on the emotional, cognitive and behavioral level. workshops focus on leadership, teambuilding, communication, personal development and project management. Besides managing her own company, Gesine is a university lecturer at the University of Göttingen for leadership, teambuilding, corporate culture and values in business. She certified as a HorseDream Partner in 2009.